Product information "SRAM Guide RS Disc Brake set"
Fast isn't about pure speed, it's about perfect speed. It's about knowing the right line and having the confidence to ride it. Flawlessly. The new SRAM Guide RS is precision at your fingertips, with a proven 4-piston caliper and innovative SwingLink lever technology that gives you more positive pad contact and increased braking authority. Light, crisp, clean and now compliments your SRAM drivetrain. Go faster. Squeeze a new SRAM brake lever and you notice it immediately. Less deadband. More positive pad engagement. A new cam system requires less lever throw to push the pads toward the rotor. That's great, but there's more to perfect braking performance than just power. You need control. Many brake systems minimize deadband-but at the cost of modulation. SwingLink solves that with its special cam shape. When the pads contact the rotor, power is modulated, avoiding that "on/off" brake feel. It's the perfect balance of power and precision. 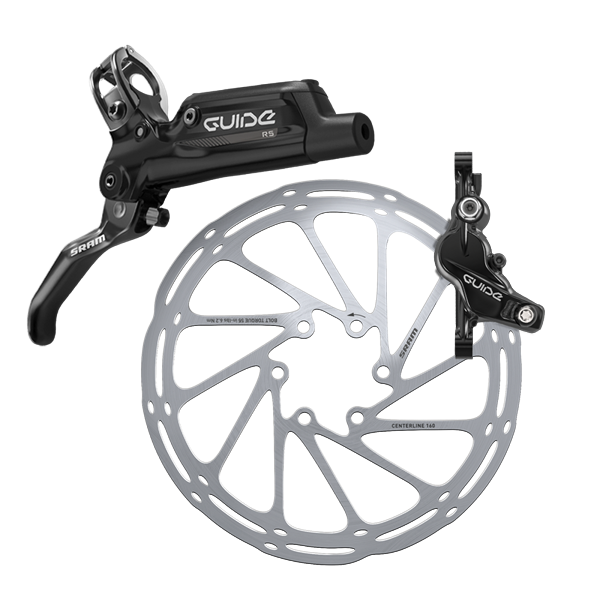 Related links to "SRAM Guide RS Disc Brake set"
Customer evaluation for "SRAM Guide RS Disc Brake set"